By the grace of God, the author writes “All the Things ‘Mama’ Didn’t Tell You About Life” in the hopes to guide readers, touch their hearts, and change their lives for the better. With the lessons that life has taught her, she heartfully expresses them hoping that her words can bring comfort and counsel to her readers and help them realize that life is indeed beautiful. 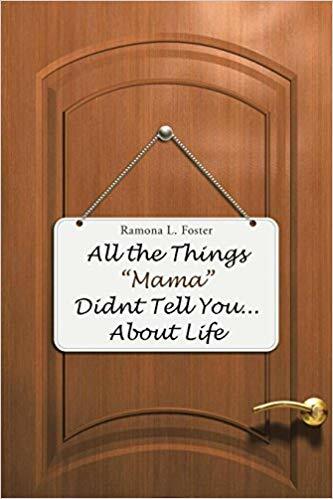 In “All the Things ‘Mama’ Didn’t Tell You About Life,” Foster openly shares her wisdom and testimonials to guide and help others through the challenges that life throws at them. With the lessons that life has taught her, she heartfully expresses them hoping that her words can bring comfort and counsel to her readers and help them realize that life is indeed beautiful. Like a mother, her guidance is filled with love and is shared with the best of intentions. Not only that, she includes the written word of God within the pages to remind each one of His unconditional love. Ultimately, this book inspires every reader to become better versions of themselves and carry with them the wisdom that will inspire them to also touch other people in their lives. Ready to reach out to a wider audience, Foster’s inspiring book will soon be displayed in the upcoming 2019 Los Angeles Times Festival of Books. Being one of the biggest book fairs in the West Coast, “All the Things ‘Mama’ Didn’t Tell You About Life” will join hundreds of other book titles exhibitors in a gathering that brings together people who create books from all over the country and share them to book lovers and literary fans alike. Be sure to save these dates! Ramona L. Foster, born and raised in Brooklyn, New York. She now resides in Mt. Pocono, PA. A graduate of Bay Ridge High School, Brooklyn, NY; went on to a career as Administrative Assistant. She’s now attending Northampton Community College, in pursuit of an Associate Degree in Business Administration. She wears many titles: Daughter, Granddaughter, Sister, Auntie (Titi), Mother and Grandmother. A member of World Changers Church New York, under the teaching and guidance of Sr. Pastor, Creflo A. Dollar (WCCI).